I'm not really a big soda drinker, but I really love root beer. I don't drink it very often, maybe just a few times a year. But when I do indulge, I sure do love it! Big brands, like A&W are okay, but I really like the artisan varieties that are sold in glass bottles. Such a treat! I recently gave in and bought Baked, a cookbook that seems to be all the rage across the blogosphere these days. I've picked it up and browsed through it numerous times at the bookstore, but never bought it. I finally bit the bullet when I ordered a few things from Amazon last week. This cake was one of the first things that called to me, and given my love of root beer, and especially root beer floats, that should come as no surprise. We were invited to a friend's house for dinner last weekend, so I offered to bring this for dessert. It is very simple and straightforward to make, and the frosting is made utilizing the food processor! I have never used my food processor for frosting before, but I have to say, it was so fun and so fast! No creaming butter, whipping egg whites, etc. Just throw everything in and pulse a few times until the frosting comes together. When it came to frosting the cake, I decided to throw caution to the wind and just go for "whimsical." This cake is not for the chocolate-weary. It is very very rich, and I highly suggest you serve it with a big scoop of vanilla ice cream to cut the richness a bit. Plus, that makes it feel like you're eating a root beer float! The root beer flavor isn't quite as pronounced as I would have liked, but according to the authors, it will intensify over the course of a day or two. I think the root beer flavor was perhaps masked a bit by the cocoa powder. It calls for dark cocoa powder, which is a much stronger taste than the classic. So I think the chocolate just overshadowed the root beer a tad. Either way, it was still really delicious. Preheat the oven to 325 degrees. Generously spray the inside of a 10-inch bundt pan with nonstick cooking spray. In a small saucepan, heat the root beer, cocoa powder, and butter over medium heat until the butter is melted. Add the sugars and whisk until dissolved. Remove from heat, pour into a large mixing bowl, and let cool. In a medium bowl, whisk the flour, baking soda, and salt together. In a small bowl, whisk the eggs until just beaten, then whisk them into the cooled cocoa mixture until combined. Gently fold the flour mixture into the cocoa mixture. The batter will be slightly lumpy; do not overbeat, as it could cause the cake to be tough. Pour the batter into the prepared pan and bake 35-45 minutes, rotating the pan halfway through baking time, until a small knife inserted in the center comes out clean. Transfer the pan to a wire rack to cool completely. Gently loosen the sides of the cake from the pan and turn it out onto the rack. To make the frosting, add all the ingredients to a food processor. Pulse in short bursts until the frosting is shiny and smooth. Add more root beer, a few teaspoons at a time, if the frosting is too thick to spread easily with a spatula. Use a spatula to spread the frosting over the crown of the cake in a thick layer. Let the frosting set before serving. Serve with vanilla ice cream on the side. I've made this recipe before. It was all gone after the first day so no one ever got to see if the root beer flavor really developed. That's not such a bad thing, I guess, since it means that everyone liked the cake anyway. Oh this right up my alley! yum!!! I am a sucker for root beer...it is the only soda I will indulge in. I am going to have to give this a try! I am very much a soda drinker and have always loved root beer. Especially now that I'm pregnant and Root Beer is caffeine free! This sounds amazing, and yet another reason to buy "Baked" that I've had on my list for a while now! I LOVE Baked! So many delicious recipes. 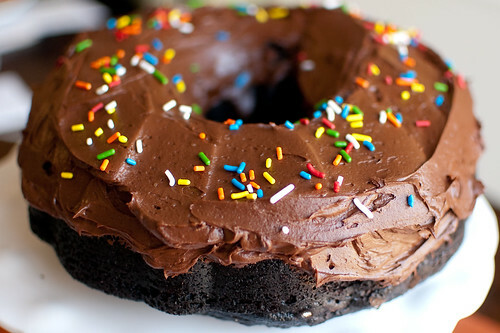 This does look like a giant chocolate donut but that's definitely not a bad thing! Very cool recipe, it looks divine and perfect for a weekend get together. LOVE this recipe! It's my go-to chocolate cake, and I make it with whatever soda I have on hand: Cherry Coke, Dr Pepper... So easy! And also awesome straight out of the freezer! A great recipe! I've made it a couple of times. To make a more pronounced Root Beer flavor, I boiled down a bottle of Root Beer and used it the frosting. YUM! I thought it was a donut at first glance. It looks great and I think I'll make it for my daughters birthday next month. Thanks for the recipe!! If I use it on my blog I'll be sure to link back to you. Such a cute post, Josie! And yes, my first thought, before reading the post's title was, "That's one huge donut!"